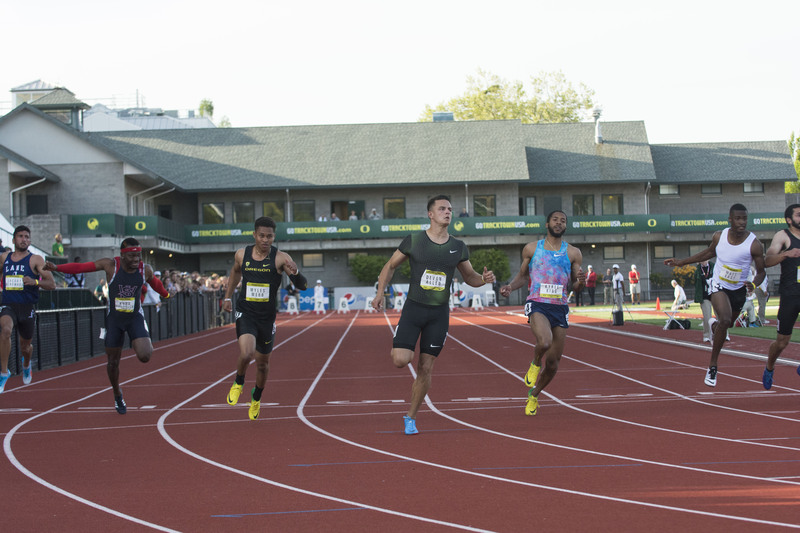 In his return to Hayward Field after relocating to Phoenix, Arizona to train, Devon Allen put on a show for the crowd with victories in meet-record times in the 110-meter hurdles and 100-meter dash Friday night. He finished the races at the Oregon Twilight Meet in 13.42 seconds and 10.29 seconds, respectively. The Olympic hurdler had some breathing room in the 100 meters, beating Oregon’s Myles Webb by 0.13 seconds, but faced strong competition in the hurdles from his training partner Jonathan Cabral and Syracuse graduate Freddie Crittenden III. Despite his strong finishing abilities, it is Allen’s start that he has worked on the most. Since moving to Phoenix and training with his high school coach Tim O’Neil, he has been practicing a seven-step approach to the first hurdle over his normal eight steps. After seeing some success with it at Hayward Field on Friday, Allen is still unsure if he will continue with the technique. While the former Ducks might not have “gruel of the competition” on a daily basis, there is still a friendly rivalry between Allen and Cabral. It was especially present in the race on Friday.